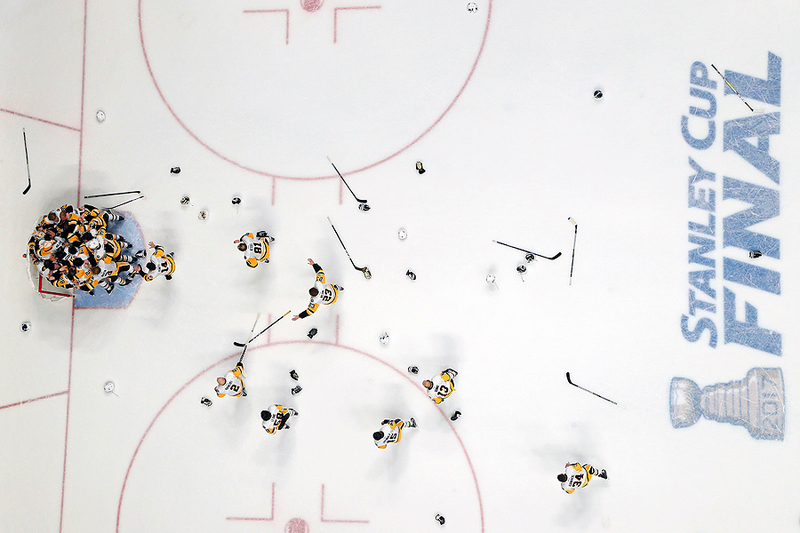 "The Pittsburgh Penguins mob goalie Matt Murray #30 as they celebrate their, 2-0, win over the Nashville Predators to win the 2017 Stanley Cup in Game Six of the 2017 NHL Stanley Cup Final at the Bridgestone Arena on June 11, 2017 in Nashville, Tennessee." As a photographer documenting the final game of the season, it's easy to think about the entire season leading up to this moment. While caught up in thoughts of pictures of the final celebration before it happens, after 'The Cup' is hoisted, one must remember that preseason, regular season, the entire playoffs, and everything in-between are just as important as the final jubilation of the year. Every game, every practice is an opportunity to fine tune skills and techniques. Studying the game and players to help anticipate what could happen in a moment like this. Without all the ups and downs of the regular season, there is no tension and no thrill. The games prior to the finals build the narrative - and this is what photography is all about - telling the story. And this year, the Pittsburgh Penguins celebrated by hoisting the Stanley Cup for the second straight year. An incredible moment and opportunity that I won't forget.